You have two kidneys, which help to make urine. They lie deep in your back just in front of your lowest ribs. One of your kidneys is diseased and needs to be taken out. After your operation, the other kidney will make enough urine for your needs. You will have a general anaesthetic, and will be asleep for the whole operation. A cut is made in your skin either in your tummy or in your back depending on your particular kidney disease. The surgeon will discuss the details with you. The kidney is taken out after tying off important blood vessels (the arteries that give blood to it and the veins that drain blood from it) and urine tubes (ureters) that drain the urine. The skin wound is then stitched up. You should plan to be in hospital for 10 days. You may well be home before this. Leaving things as they are will mean that your kidney problem will just get worse. For kidney stones shock wave treatment is usually a good way of getting stones out of the kidney, but in your case this will not help. 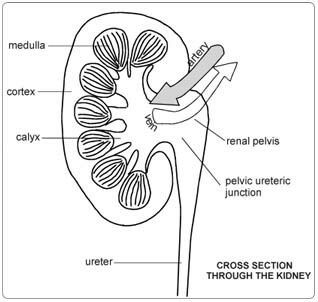 For cystic kidneys, there are ways of draining the kidney using keyhole operations, but again these are not the best ways to solve your problem. Taking out the kidney with a keyhole surgical procedure is not always possible and it takes place only in some highly specialised centres. It would not be suitable for your kidney. You do not need a kidney transplant as your remaining kidney can produce the quantity and quality of urine that you need on daily basis so that you will be entirely healthy. Stop smoking and try to get your weight down if you are overweight. (See Healthy Living). If you know that you have problems with your blood pressure, your heart, or your lungs, ask your family doctor to check that these are under control. Check the hospital’s advice about taking the Pill or hormone replacement therapy (HRT). Check you have a relative or friend who can come with you to the hospital, take you home, and look after you for the first week after the operation. Sort out any tablets, medicines, inhalers that you are using. Keep them in their original boxes and packets. Bring them to the hospital with you. On the ward, you may be checked for past illnesses and may have special tests to make sure that you are well prepared and that you can have the operation as safely as possible. Please tell the doctors and nurses of any allergies to tablets, medicines or dressings. You will have the operation explained to you and will be asked to fill in an operation consent form. Many hospitals now run special preadmission clinics, where you visit for an hour or two, a few weeks or so before the operation for these checks. You will have a fine soft plastic tube passed into your bladder before the operation. For females this may be done on the ward. For males it is done when asleep in the theatre. Although you will be conscious a minute or two after the operation ends, you are unlikely to remember anything until you are back in your bed on the ward. Some patients feel a bit sick for up to 24 hours after operation, but this passes off. You will be given some treatment for sickness if necessary. You will have a fine, thin drip tube in an arm vein connected to a plastic bag on a stand containing a salt solution or blood. There will probably be a fine plastic tube coming out near the skin wound (this is to drain any residual blood or other fluid from the area of the operation) and possibly a fine plastic tube in your nose to drain your stomach. You may be given oxygen from a face mask for a few hours if you have had chest problems in the past. A general anaesthetic will make you slow, clumsy and forgetful for about 24 hours. The nurses will help you with everything you need until you are able to do things for yourself. Do not make important decisions during this time. The wound is painful and you will be given injections and later tablets to control this. Ask for more if the pain is not well controlled or if it gets worse. You will most likely be able to get out of bed with the help of the nurses the day after operation despite some discomfort. You will not do the wound any harm, and the exercise is very helpful for you. The second day after operation you should be able to spend an hour or two out of bed. By the end of four days you should have little pain. The tube in your bladder may drain bloodstained urine for a day or two. The tube will be taken out once the urine clears. After that it is important that you pass urine and empty your bladder normally. If you have difficulty the doctors and nurses will be pleased to sort the problem out. The wound has a dressing which may show some staining with old blood in the first 24 hours. The dressing will be removed and the wound will be sprayed with a cellulose varnish similar to nail varnish. You can take the dressing off after 48 hours. There is no need for a dressing after this unless the wound is painful when rubbed by clothing. There may be stitches or clips in the skin. Sometimes, the wound is held together with stitches underneath the skin that you can’t see and which eventually get dissolved. The thin plastic drain tube is removed when it stops draining – usually after 48 hours. There may be some purple bruising around the wound which spreads downwards with gravity and fades to a yellow colour after two to three days. This is expected and you should not worry about it. There may be some swelling of the surrounding skin which also improves in two to three days. After 7 to 10 days, slight crusts on the wound will fall off. Occasionally minor matchhead-sized blebs (blisters) form on the wound line, but these settle down after discharging a blob of yellow fluid for a day or so. You can wash as soon as the dressing has been removed but try to keep the wound area dry until the stitches/clips come out. If there only stitches in the inside of the wound try to keep the wound dry for a week after the operation. Soap and tap water are entirely adequate. Salted water is not necessary. You will be given an appointment to visit the outpatient department for a check-up. The nurses will advise about sick notes, certificates etc. You are likely to feel very tired and need to rest two or three times a day for three weeks or more. You will gradually improve so that by the time two months have passed you will be able to return completely to your usual level of activity. You can drive as soon as you can make an emergency stop without discomfort in the wound, i.e. after about three weeks. You can restart sexual relations within two or three weeks when the wound is comfortable enough. You should be able to return to a light job after about eight weeks and any heavy job within 12 weeks. Complications are relatively unusual but are rapidly recognised and dealt with by the surgical staff. If you think that all is not well, please let the doctors and nurses know. Bruising of the wound can be troublesome but most of the time settles. There is a 2% chance of an infection of the wound which can be settled by taking antibiotics for a week or two 1-2 week. The drainage tube near the wound may drain old blood for up to a week. This drainage settles down. Very rarely, it doesn’t settle down or gets worse in the first few hours/days after the operation. This means that some damage has occurred during the operation in one of your blood vessels or other organs of your abdomen and you will most likely need another operation to fix the problem. The operation should not be underestimated. Some patients are surprised how slowly they regain their normal stamina. However, virtually all patients are back doing their normal duties within three months. These notes will help you through your operation. They are a general guide. They do not cover everything. Also, all hospitals and surgeons vary a little. If you have any queries or problems, please ask the doctors or nurses.